The dolls are designed to sit snugly one inside the other. For ease of movement, lightly rub a plain wax candle on the inner grooves as necessary. Authentically sourced Russian-made Matryoshka dolls, handcrafted from turned linden wood and painted and layer lacquered in the time-honoured tradition by a professional nesting doll artist. Traditional 5 piece set doll. Largest approx. 3.5 inches tall. Note: this service is for practitioners and clients only. Please email rlharrispsy+dolls@gmail.com for order enquiries. The Babushka doll contains within itself as a form, all that is good, true, beautiful and one. It is a time-honoured archetype of the slow and complex flowering of human development across the lifespan. Each stage honoured, from the delicate simplicity of the tiniest doll, to the rich detail lavished on the largest. Its form embraces each stage of development. As such, the symbolism contained within the Babushka is robust, and as a Reflective Therapy, can be used with confidence for both male and female clients. 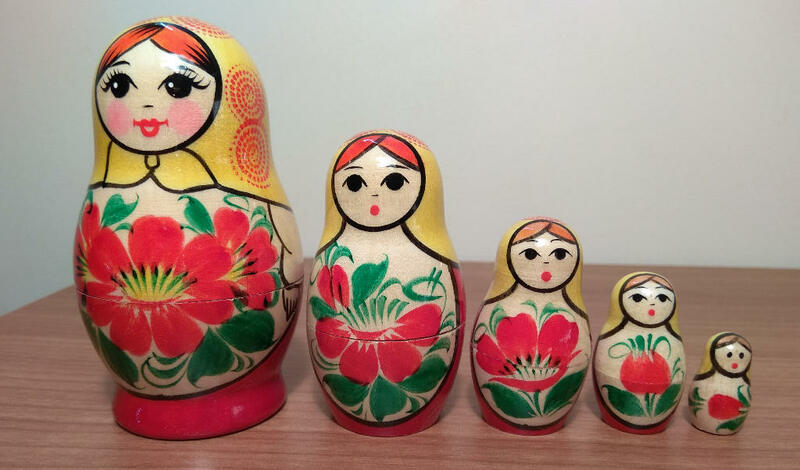 A Babushka doll, also known as a Matryoshka doll: a set of wooden nesting dolls of decreasing size placed one inside the other, was first produced in Russia in 1890. The Babushka doll is a fundamental therapeutic tool within the RIT™ model of therapy, and is one of the main resources used within the programme’s Reflective Therapies. The doll therapies have been written specifically for a 5 piece set. It is essential for the therapist to purchase a 5-piece set Babushka doll prior to commencing the RIT™ programme.